Thanks to everyone who participated in this round. We had 20 participants from three countries, and we cooked with our homegrown chard, basil, mint, rosemary, zucchini, cherries, amaranth, manathakkali, cinnamon basil, orange mint, chives, fennel, parsley, cilantro, Thai basil, black raspberries, quail eggs, plums, and peaches. If you are new to Grow Your Own, visit the Grow Your Own page to learn more about the event. The deadline for the next round is July 30 and Bee and Jai of Jugalbandi are hosting. Visit their blog for information on how to participate. 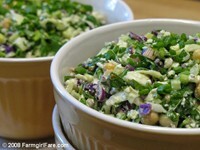 Susan of Farmgirl Fare (Missouri, United States) was inspired by her friend’s fresh veggie salad and created her own tasty version using her homegrown swiss chard and scallions. Deciding that “grass lawns are so 20th-century,” Susan of Wild Yeast (California, United States) felt inspired to start a garden plot in her front yard. She turned her homegrown basil into pesto and brushed it on these beautiful fan rolls. Chris and Lisa of We Heart Food (Washington, United States) needed something light after enjoying some very rich meals on their vacation. 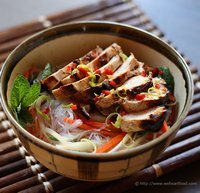 They picked some of the mint growing in a planter in their front yard and made a healthy Vietnamese chicken and noodle dish. 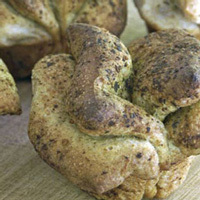 AS of Life’s Too Short for Mediocre Chocolate (California, United States) had plenty of zucchini in her garden to experiment with and made three loaves of this tasty zucchini pineapple bread while testing a new recipe. Jeremy of Roasting Rambler (Iowa, United States) picked sour cherries from his father’s trees and turned them into a nice, chunky jam using no-sugar pectin and some almond extract. 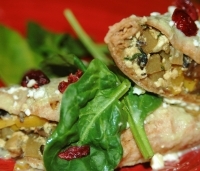 Erika of Tummy Treasure (Wisconsin, United States) is growing rainbow chard for the first time, and had the great idea to use it in vegetarian burritos, which she served with beets and peas also from her garden. 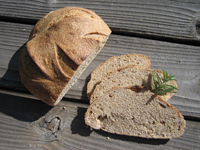 After squirrels and chipmunks made off with her tomato plants, Claire of Beginning with Bread (Colorado, United States) rescued her herbs by moving them indoors, and celebrated the survival of the rosemary by making this rosemary olive oil sourdough bread. Shannon of Writing As I Eat (South Carolina, United States) has an abundance of zucchini in her garden and made an easy and decadent zucchini bisque with bacon and cream. Did I mention it was decadent? 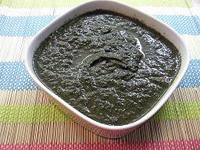 Using some of the fresh chard, amaranth, and manathakkali growing in the yard, Daily Musings (Maryland, United States) made a mash of greens to enjoy with rice and roasted banana or taro root. Kaykat of Cooking from A to Z (Washington, United States) made some tasty squash and paneer enchiladas and flavored them with lots of fresh herbs from the garden. Priya of Live 2 Cook (Massachusetts, United States) accidentally started a mint plant and now has mint growing year-round. She made a healthy potato pulav using her fresh homegrown mint. 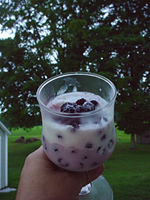 After realizing that the black raspberry bushes in her yard had some fruit, Rachel of Crispy Cook (New York, United States) rescued some of the beautiful berries before the birds could get them and made easy and lovely parfaits. 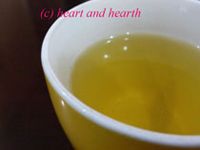 Ning of Heart and Hearth (Manila, Philippines) explains how to use the green leaves of the lemongrass plant to make a soothing and healthy tea. After weeks of traveling and being busy, Denise of Chez Us (California, United States) felt a need to get back into the kitchen. 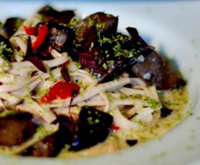 She picked some of the Thai basil in her garden and tossed together a quick and tasty meal of lomen noodles with eggplant and a spicy coconut broth. 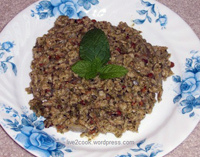 Mint pairs perfectly with lamb, and Mona of Zaiqa-Modern Hyderabadi Cuisine (Canada) shows how to use homegrown mint in a ground lamb dish known as kheema, which can be eaten as a side dish or used to fill parathas or samosas. 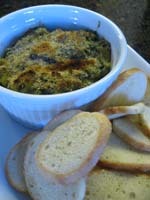 Jessica of Finny Knits (California, United States) thanks a blog stalker for sending her a great cookbook and whips up a Swiss chard gratin using some of the fresh chard from her garden. 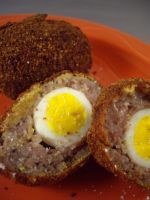 After receiving a gift of fresh quail eggs from a friend’s farm, Becke of Columbus Foodie (Ohio, United States) wrapped them in breakfast sausage and made miniature Scotch eggs. Elle of Feeding My Enthusiasms (California, United States) used some fresh plums from the tree in her yard and made a beautiful coffee cake. She sent it over to the volunteer firefighters, who I think were quite lucky to get it! 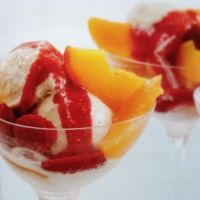 Mansi of Fun and Food (California, United States) made a tasty vanilla-cardamom ice cream and topped it with a homemade raspberry sauce and the fresh peaches her cousin gave her from the garden. 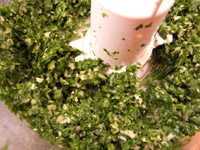 I (Virginia, United States) made a simple marinade for chicken using fresh parsley and cilantro from our garden along with fresh garlic and olive oil. The food processor did all the work. Previous Post: « Hawaiian Shave Ice: Which One Is Our Favorite? What a great roundup — I’m looking forward to checking out all of the fresh dishes! Grow Your Own is a fantastic event, and I am glad I could participate. I look forward to participating many more times for GYO. 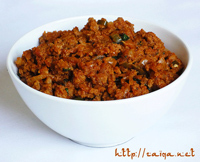 So many of these dishes look fantastic! Well, actually all of them do- what a fantastic inspiration. Thank you! Hey, Andrea. Looks great. Sorry I missed this one – just couldn’t get it together last weekend. I’ve got a few ideas for upcoming events, though. See you next time. I think I need a bowl of that zucchini bisque with bacon and cream! You got wonderful dishes here! Wow! Awesome Roundup! I am so happy to see so many gardeners. Great roundup Andrea. I still am having problems with the pixel sizes so haven’t been submitting but reading. So many great recipes that I will totally use in this month’s round up. Thanks Andrea! Mmmm, these all look great. Sorry we missed this one, we’ve got lots lined up for the next events!